Jive Time Turns Twelve! Join us in celebration Saturday, August 24th, from 10:00 am to 9:00 pm, for our biggest sale of the year! ALL USED LP’S, CD’S AND DVD’S 25% OFF! In addition; all new vinyl reissues, accessories and Jive Time merchandise will be 10% off! 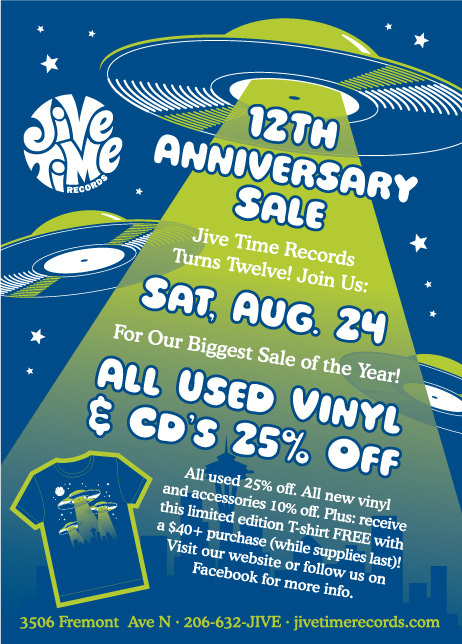 Plus, get a FREE, limited edition Jive Time Anniversary/Flying Saucers T-shirt with a $40.00+ purchase (while supplies last).